Noise has been somewhat of a problem with mini CNC. The machine is fairly quiet at most of the feedrates. However there are a couple of feedrates that result in loud and nasty vibration. In my testing these are 2.1 IPM and to a lesser degree, 4.2 IPM. Any diagonal move that happens to have one of the axes moving at these speeds becomes a problem. Instead of steel nut, a plastic nut is in contact with the bearing. 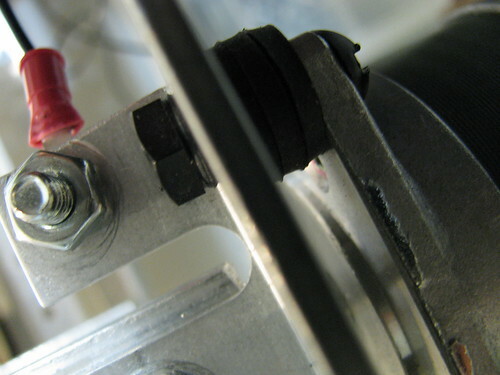 Not visible in the picture, there is some teflon tape wrapped around the leadscrew where the (ball) bearing is. 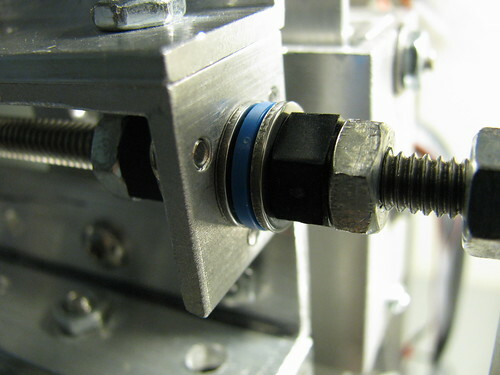 This prevents leadscrew from rattling around. I added the thrust bearing for reasons other than noise control, but it also has a plastic nut. 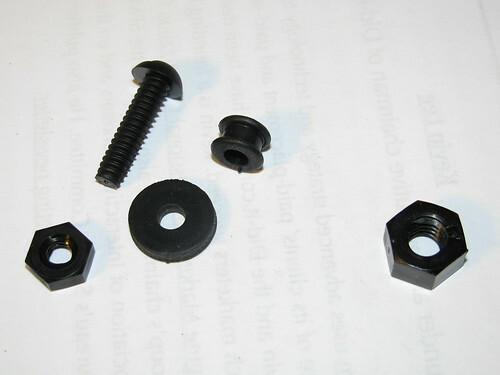 The combination of plastic nuts with steel nuts should eliminate the need for spring washers (which were skewing the nuts). 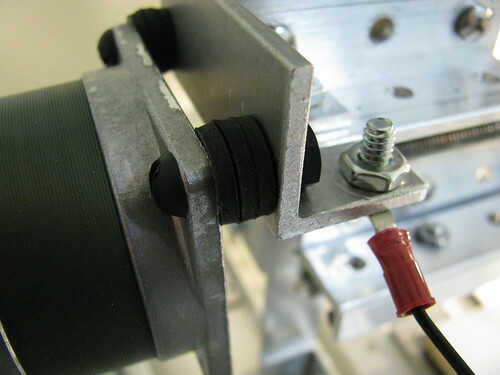 The motor is connected to the mount with nylon screws and nuts. There are several neoprene washers in between, as well as a pair of grommets in the mount holes (visible on the right pic). I found that metal screws didn't really work well there. The motor flexes on this mounting, but not in the twisting direction so it seems OK. I kind of knew this already, but besides vibration isolation, the other important thing that reduces vibration is microstepping. With half stepping, the noise was still too much even with the 2 modifications above. 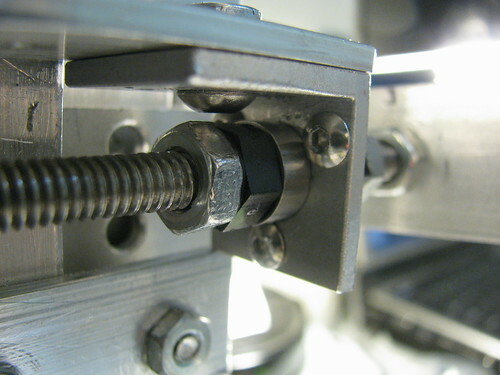 I went an extra step and made a 1/4-20 Delrin nut for X-axis because there was an audible rattle between leadscrew and leadnut; thinking that it would quiet things down. However, with half stepping, that didn't significantly help - but the noise reduction was more pronounced with microstepping. I used TinyG but I'm planning to switch over to grblShield - both are 1/8 step. I measured the following max values using Sound Meter Lite Android app. Anything under 60 dB sounds good enough to me. Again, these are supposed to be worst case scenarios - with the disclaimer they were tested on a single axis. Nice research work, it's good to have some numbers on the noise. About microstepping, at the spped 1/2 stepping makes a lot of noise, it indeed makes things much better. But I have found that ( when changing to microstepping ) the noisy range does not dissapear but moves ( eg. happens at different speeds ), and that the range of speeds at which this happens reduces too. The thing to be careful about is that while you get less vibration, and vibration less often, you loose much more torque when the vibration happens with microstepping than with half stepping. Meaning that with microstepping you have more chances that your axis actually "blocks", while with half-stepping, you get a lot of noise, but you get less chances to block. In the end, you can get a microstepping set-up to never block, mostly by fine-tuning the current setting, and having a well-aligned machine.